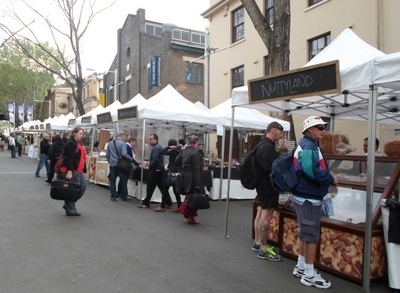 There are markets in Sydney for the foodies. Markets for the fashion-conscious. Markets that just sell secondhand or 'pre-loved' goods and others that sell all sorts of wares. They're big, they're small and everything in between, and can take place every week or perhaps just once a year. There's so many options in Sydney, yet instead of being overwhelmed, many of us still manage to find a favourite that we return to again and again. What do you think is the best market in Sydney? I love venturing out to Manly Markets, which are open every weekend on the Corso. The merchandise is top quality and unique. You will find everything from jewellery to clothing to homewares at very reasonable prices. I love Paddington Markets for their range of stalls, including jewellery, clothes, art and body products. The prices are usually reasonable and I can never visit the markets there without buying at least one thing. Also, Glebe Markets are really great for finding antiques, as well as new stuff. My favourite is The Rocks Markets. There's so much variety on sale that it's always interesting to look through the stalls. They might not change that often, but I always manage to discover something to buy (and I'm not an impulse buyer at all, so that's quite impressive). There's often lots of tourists, but it adds to the relaxed, fun atmosphere and there's usually live music to enjoy. I enjoy The Rocks at any time too. Rocks markets are my favourite but The markets at Rouse hill Town centre are with the visit too. I absolutely love "Parklea Markets", which are open on Friday, Saturday and Sunday. I mostly go for the fresh fruit, veg and seafood (which is amazingly fresh and cheap! ), but they also have a great range of clothing, electronic, and other specialty stores. This market is not so much for the homemade and handmade, but rather for people looking for everyday items at a great price. Rozelle markets are the best in my opinion, you'll always find something there and theres always new and different stalls coming up. Kirribilli markets are also always good!